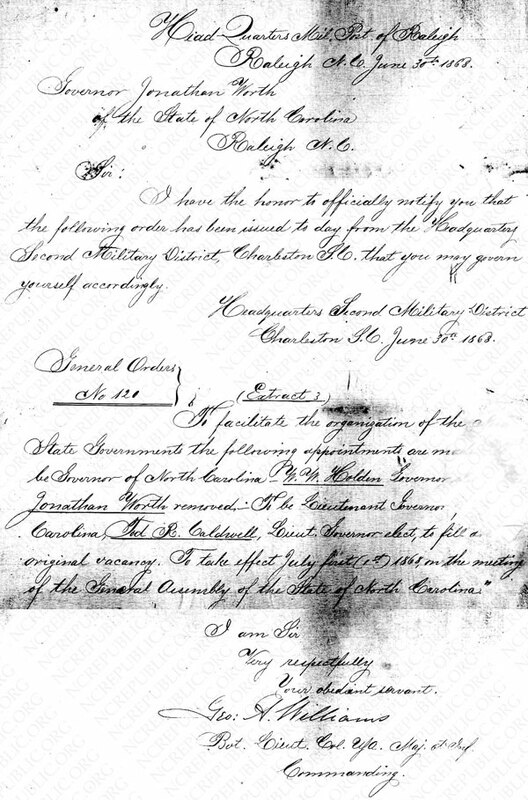 After the passage of the Reconstruction Acts of March 2, 1867 and March 23, 1867, this military order was issued for the enforcement of these Congressional Acts, removing the elected governments of North-Carolina and South Carolina by the threat of military force. I have the honor to officially notify you that the following order has been issued to day from the Headquarters Second Military District, Charleston S.C. that you may govern yourself accordingly. To facilitate the organization of the New State Governments the following appointments are made. To be Governor of North Carolina, W.W. Holden, Governor elect, vice Jonathan Worth removed To be Lieut Governor elect of North Carolina, Tod R. Caldwell, Lieut. Governor elect, to fill our original vacancy. To take effect July first (1st) 1868, on the meeting of the General Assembly of the State of North Carolina. Bvt. Lieut. Col. *** Maj. at **** Commanding.